Elsie May Robson, nee Dawson (b.1886 fl. 1908-1959, exhibited 1920-1959). 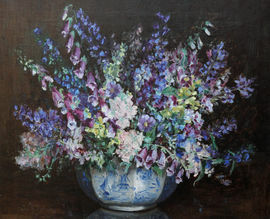 Painter born in Wakefield, Yorkshire who was a regular exhibitor at the YUA from 1908, showing a range of landscapes and still life paintings in oil and watercolours. Lived in Leeds. Studied at the Leeds School of Art under Owen Bowen who became a friend. Exhibited at the Walker Gallery in Liverpool, the Royal Academy, the Royal Cambrian Academy, the Fine Art Society.